Perfume is a big part of who I am, the smell that I choose to wear and buy, I think describes the sort of person I am. I usually go for very flowery and fruity fragrances. When Cheryl's Stormflower came out, I couldn't help but fall in love with it. Since then she's bought out an EDT out and the newest one is 'Noir'. Of course, I had to get my hands on it and see what it's like. Top notes of pear, mandarin and rhubarb blend with opulent floral heart of tuberose, rose petals, heliotrope and orange blossom. The composition ends with a trace of musk, brown sugar, ambrette seed and sandalwood. 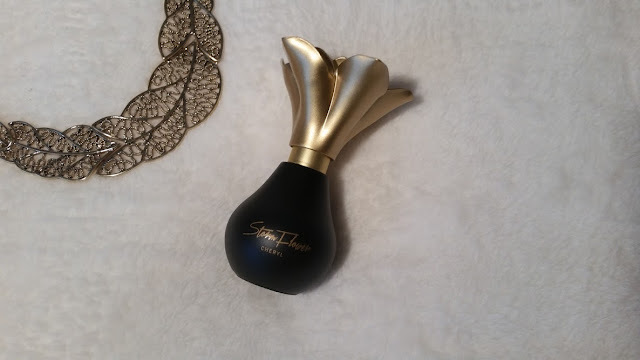 The bottle design is identical to her other two perfumes, a coloured glass bottle with gold detailing and petals on the top to go with the name of the fragrance. Cheryl's perfume range is highly successful as it is aimed at much of a larger audience. far too musky for the day time and upon first smell, very strong. I wasn't particularly excited about the perfume at first due to the strong smell but then when I was getting ready to go out one night, I decided to spray. It all changed from there. I ended up liking the smell as it settled on my body and the rose came out to make me fall in love with it. It lasted for a good 2 hours on me, saying that perfume never lasts on me anyway. No matter the price or brand. The musk is definetley something you have to get used to, and can make you smell like a man. Noir has become my night time perfume, where as during the day I stick to something a bit more classic - Coco No5. What's your go to perfume?